We have been advised by the University of Auckland that they are driving their contractors to have the Maidment Theatre repaired by the end of June. If this time frame is achieved, which we have every reason to believe it will be, the season of The Heretic and The Lion Foundation season of Lord of the Flies will go ahead as scheduled. Can’t wait to have you back Maidment! UPDATE 17/4: Assessments and works continue at the Maidment Theatre, and a plan as to when the theatre can reopen remains unclear. Rows of lights can currently be seen inside the theatre foyer. The fate of the Musgrove Studio is also up in the air. Covert Entertainment’s season for the Comedy Festival from May is no longer going ahead at the Musgrove, and will now appear at the Herald Theatre (some of their shows unfortunately were cancelled). 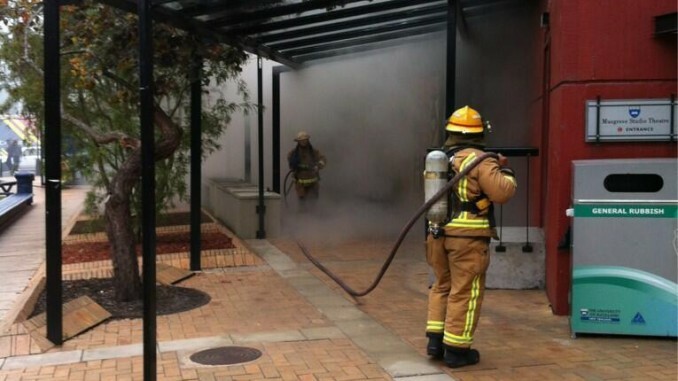 Maidment's Tweet: "We do not have a new pope"
I, along with many in the Auckland Theatre community, were in shock and disbelief when the news started to break of a fire in the Maidment Theatre late afternoon on Wednesday 3 April. Quickly the Maidment Theatre twitter account reassured us that the staff and theatre users had all been evacuated safely. Indeed, the Maidment’s twitter handle first gave us some trademark dark humour, announcing that they did not have a new pope, alongside a photograph of the Maidment with a worrying level of smoke rising out of it. I followed the updates as we heard more news: reports of 30 firemen in attendance, that the Maidment curtain that caught on fire that quickly spread, and finally, that the fire had been put out. The question we all wanted to know, and dreaded the answer to, was: how bad the damage? There is still no firm public answer. Memories of the St James Theatre, shut after fire damaged and still with its doors firmly closed years later, was a worrying precedent. So too previous angst when the University indicated they were interested in using the theatre for their own internal purposes. The Maidment, which opened in 1976, fills a critical role within Auckland’s arts ecology, most recently hosting Auckland Festival performances of Leo and Rhinoceros in Love. The theatre itself (and the Musgrove Studio space) has an unassuming, comfortable, and practical feel, and has played venue to too many magical theatre moments to list. Its a theatre space I love dearly. I trust I don’t have to yet write the eulogy. Performances of the Engineering Revue Finding Nano, due to open the following night on the mainstage, and one woman show Karl Urban Makes My Lady Parts Tingle at the Musgrove, were cancelled. Auckland Theatre Company announced they were proceeding with business as usual for their production of Dean Parker’s Midnight in Moscow pending further word from the theatre. Well, the news is out, and its looking grim for the Maidment, in the short-term at least, with the future still too smoky to see. 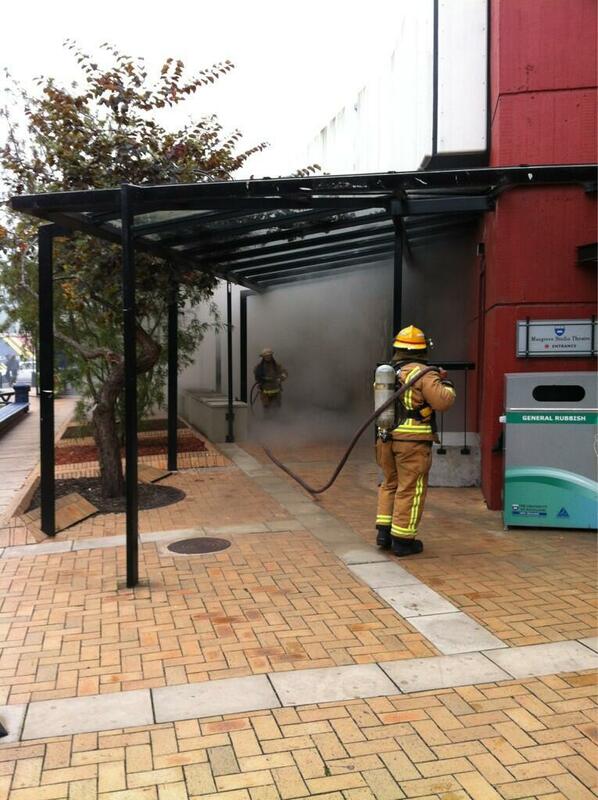 Official statement: An investigation is currently underway at The University of Auckland to determine the cause of a fire that broke out at the Maidment Theatre at 4.30pm yesterday. 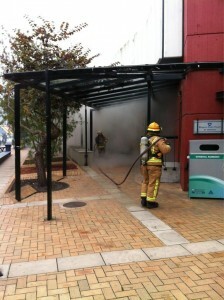 There are no suspicious circumstances involved; at this stage it appears that a curtain was ignited by a stage light. The damage is mainly contained within the stage area, but the full extent of the damage is still being assessed. We have informed The Auckland Theatre Company that we will not be able to provide the venue for ‘Midnight in Moscow.’ There will likely be some further disruption to scheduled performances, the extent of which is unable to be confirmed pending the damage assessment. The Don Binney painting housed in the Maidment Theatre appears to be undamaged but will be professionally assessed. Today Auckland Theatre Company has been announced that Midnight in Moscow will now play at the The EDGE’s Lower NZI space at the Aotea Centre, and joked that trouble has followed the “Russian Play” after its debut season was cancelled following the Christchurch Earthquake. Due to the fire at Maidment Theatre, Auckland Theatre Company’s production of MIDNIGHT IN MOSCOW will now preview on Monday 15 April at the NZI Room in the Aotea Centre and run through until May 4. “These dates will enable most people to attend the show on the same date as they had already booked,” says Auckland Theatre Company General Manager, Lester McGrath. “This whole situation really emphasises the need for Auckland Theatre Company to have its own home,” says Malcolm. 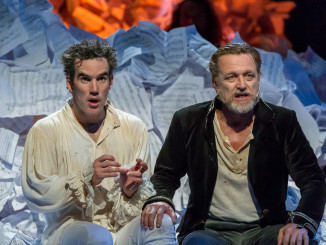 MIDNIGHT IN MOSCOW opened at Christchurch’s Court Theatre and ran for two performances before the season was cut short by the February 2011 earthquake. The set for the show still stands in the old Court Theatre at the Christchurch Arts Centre. 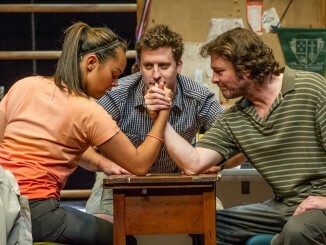 “This is a great New Zealand play and deserves to go on. There’s more twists, turns and espionage getting the play mounted than there is in a John Le Carre novel. We’re beginning to think there is a secretive organisation bent on sabotaging ‘The Russian Play’. This is the most popular show in our subscription season and we hope the people of Auckland rally behind our cast of troupers in their temporary home,” says Auckland Theatre Company Artistic Director, Colin McColl. The Lower NZI in the bowels of the Aotea Centre is a good solution under difficult circumstances. Previous performances in this space have included Apollo 13, Kafka’s The Trial, and Flintlock Musket, and I’m confident ATC will be able to do something suitably enigmatic and creative with the space. An announcement regarding the location for the season of The Glass Menagerie, which was also booked for the Maidment in May, is yet to be made. The Maidment remains shut for the time being. The producer of Defensability, which was due to perform at the smaller Musgrove Studio next week was advised that the Musgrove’s wiring was possibly damaged by the fire and they cannot use the space. They are currently searching for a new venue with wheelchair access. Thoughts remain with the Maidment staff. On behalf of the many who have enjoyed coming to the theatre show after show, I wish for a speedy recovery. I will continue to update this post as further information is announced.